On Monday, 5 November 2018, Heritage NL facilitated a workshop in partnership with the Town of Carbonear to discuss a multi-faceted approach to revitalizing the downtown core and waterfront with a particular focus on utilizing the community’s cultural assets. The workshop comprised two parts: I) a vision session where people identified what they would like to see in the Carbonear heritage district of the future; and II) a session to explore what is needed to develop local heritage and business assets. Participants were in agreement they would like to see more business development, and more economic growth in the community. Participants noted that any plan needs buy-in/commitment from community. Therefore, a follow-up meeting will be held at the Princess Sheila Seniors Club Building, Water Street, Carbonear, on Wednesday, December 5th, at 6pm. Identify local leadership -> who will take the ball and run with it? This event is free, and open to anyone who is interested in the heritage and business development of Carbonear. Tea/coffee will be available! photo: 1911. Commemorating the coronation of King George V, present Queen's grandfather. 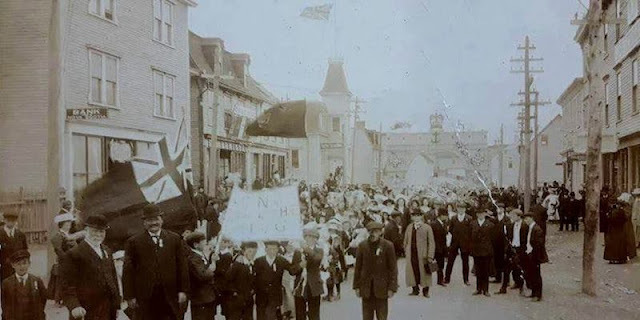 Photo compliments of Tracy Oates/Carbonear Heritage Society Facebook page.